Fifteen-year-old Tyler Buckspan lives with his mom and grandmother in 1960s Cassadaga, a Florida community where spiritual “mediums” ply their trade. The mediums--Tyler’s grandmother among them--read palms and tarot cards, conduct seances and speak with the dead. Tyler’s a loner, a bookish boy with few interests, until his half-brother Devin, nineteen and a convicted arsonist, comes to live in Tyler’s home. For years, Tyler has ignored his attraction to other boys. But with Devin in the house, Tyler can't deny his urges any longer. He falls hopelessly in love with his miscreant half-brother, and with the sport of basketball, once Devin teaches Tyler the finer points of the game. In a time when love between men was forbidden, even criminalized, can Tyler find the love he needs from another boy? And is Devin a person to be trusted? Is he truly clairvoyant, or simply a con artist playing Tyler and others for fools? What does Devin really know about a local murder? And can Tyler trust his own psychic twinges? 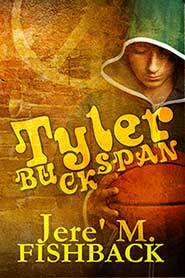 Add your review of "Tyler Buckspan" in comments!